Everyone is excited to head to Argentina in their love quest, which definitely is a step above Uruguay in terms of romantic vacations. For some reason, Chris Harrison decides to show up to work outside the rose ceremony and interviews JoJo about her current state of mind. But guys, twist alert: there's ANOTHER 2-on-1 Thunderdome date coming. Yessss! The first one-on-one date goes to radio DJ Wells, who sadly did not bring All 4 One with him to South America. Also, he's the only guy who hasn't kissed JoJo so this is a big ol' awkward date moment to come. They watch try some of the Fuerza Bruta live show stunts, including getting fake shot on a treadmill and slipping around a suspended pool. After a very horrible cheek kiss earlier in the date, JoJo leans in and kisses Wells in the pool and then they can't stop smooching. At dinner, Wells is extremely happy as he finally feels like he's come alive for JoJo. Par for the course, JoJo asks about his last relationship which was four years that evolved from romance into best friends. JoJo believes fairy tale, unicorn-love exists and Wells is obviously skeptical (or hates Disney movies). JoJo decides that while Wells is a great guy, he's likely not the guy she'll spend the rest of her life with and does not give him the date rose. And so Wells heads home in an Uber and JoJo cries alone in a rainy rave. The group date guys meet up with JoJo in Buenos Aires in the La Boca district to walk around in their skinny jeans and not get wedgies while living it up like tourists. Drinks, tango, pick-up soccer - it's just missing the Evita soundtrack but I'm singing that along in my head. This is also the date narrated by James Taylor and his whole "I'm not the hot guy but I could be great" spiel and it's getting old pretty quick. The night portion of the date is JoJo hanging all over frontrunners Luke and Jordan, but they are wearing matching leather jackets with JoJo and matching jackets attract. It's known. James Taylor is falling for JoJo and decides to be the guy who has to tell her the "other side" of Jordan, which is people listen to him because he's attractive and F-list famous. There's like zero evidence, so they move on to kissing. James Taylor's tattling leads to JoJo tattling on him to Jordan about his "entitled" behavior during poker. Jordan defends himself while JoJo strokes his hair, then returns to the guys for some wine and awkward silence. Jordan confronts James Taylor about the use of the word "entitlement" and why a game of poker has led to this. Guys, just play Ticket to Ride next time where the rules are on paper. The group date rose goes to Luke and his lingering open mouth kisses that didn't take about poker table drama. JoJo puts on a blue prom dress for the cocktail party/rose ceremony and ponders which guy she should dump this time. Jordan takes JoJo aside to let her know his intentions are true and he wants to be engaged at the end of this thing. Alex knows he's probably most screwed, but also could be James Taylor and his sad sack narrative he keeps giving himself. But a well timed "I'm falling for you" might be his saving grace. JoJo hands her first two roses to Robby and Jordan, but pulls the ol' Runaway Bride for the final rose. Chris Harrison eases JoJo down with little to no authenticity and takes the rose back. 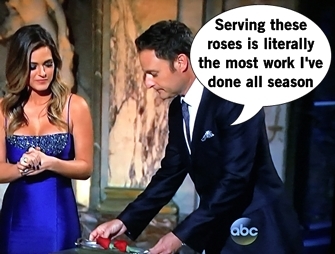 JoJo heads back into the Rose Ceremony sans rose and pulls the ol' switcheroo: Chris Harrison brings out a plate with two roses to save them both. Oh great, push the inevitable off for one more episode.